237a strip or disconnection modules are available from stock also available are the sub-rack and connection boxes available to house these BT style strips. The 5BSurge Protector snaps in to either 237A or 237B Strips and accepts up to 10 Surge Arrestors. 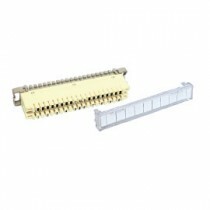 Terminal Strips are used to join Multipair Telecom and Data Cables.